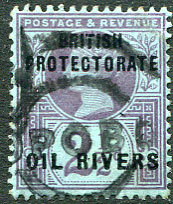 (T.9B) dated B/AP 4 1901 on QV 1d (SG.22). 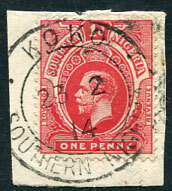 (T.7a) 23 2 14 on KGV 1d (SG.46) piece. 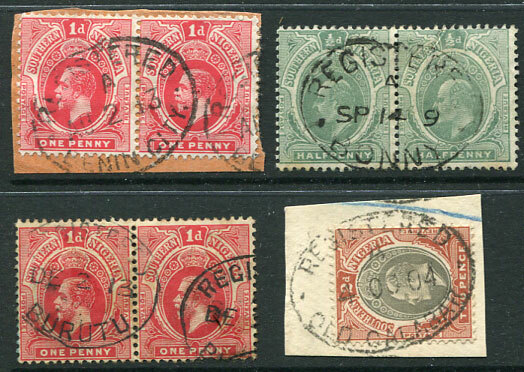 (T.7A) AP 25 13 on KE7 1d (SG.34) piece. (T.6B) MY 9 13 on KE7 1d (SG.34) piece. 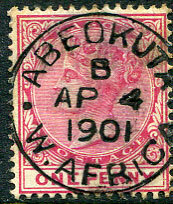 (T.3A) A/14 NO 06 on Lagos KE7 1d (SG.55). (T.7a) 2 SE 09 on KE7 1d (SG.34). 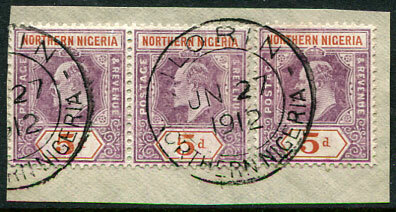 (T.3b) A/JU 8 07 on Lagos KE7 1d (SG.55), surface rub right side. 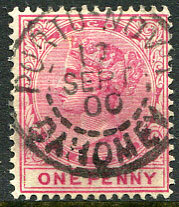 dated 13 SEPT 00 on QV 1d (SG.22). 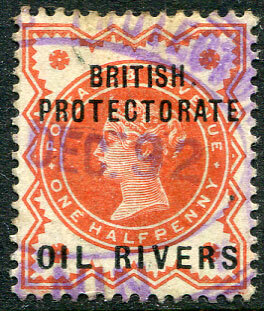 (T.2 in black) dated A/MY 30 94 on QV ½d vermilion. (T.9A) B/NO 21 1901 (ERD) on QV 1d (SG.22), odd blunt perf. 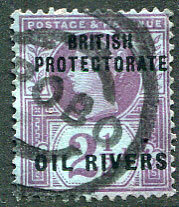 (T.R4) dated A/AP 20 97 on QV ½d. 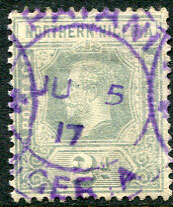 (T.P3) on GB ovp'd QV 2½d (SG.4), thinned corner. 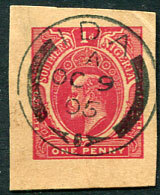 (T.1a) dated A/JY 5 98 struck over purser's manuscript "X" on Gold Coast QV 2½d (SG.14). 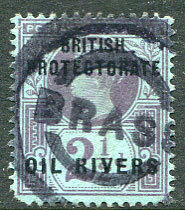 (T.R6) part dated B/-- NO 00 on QV ½d. 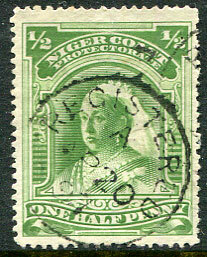 (T.P3) on GB ovp'd QV 2½d (SG.4), blunt lower left corner perf. 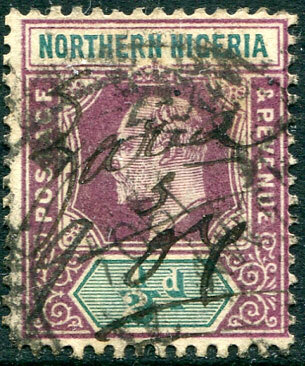 in blue dated DE 31 02 (LRD) on KE7 ½d (SG.11). 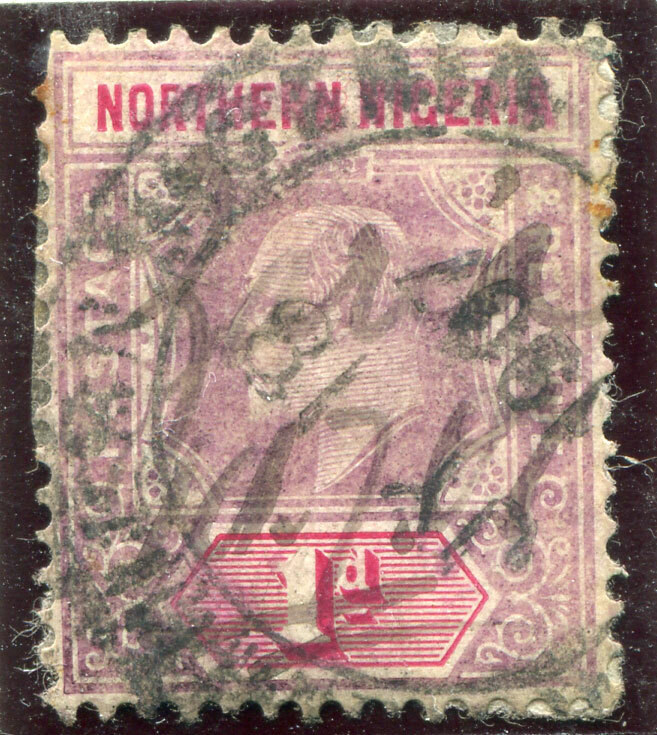 manuscript dated "Zaria 10.7.8" overstruck JY 18 1907 d/ring (at ZUNGERU?) 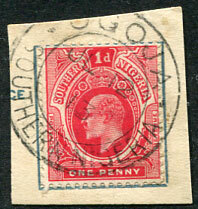 on KE7 1d (presumed SG.21 as envelope paper backed), corner perf. fault. 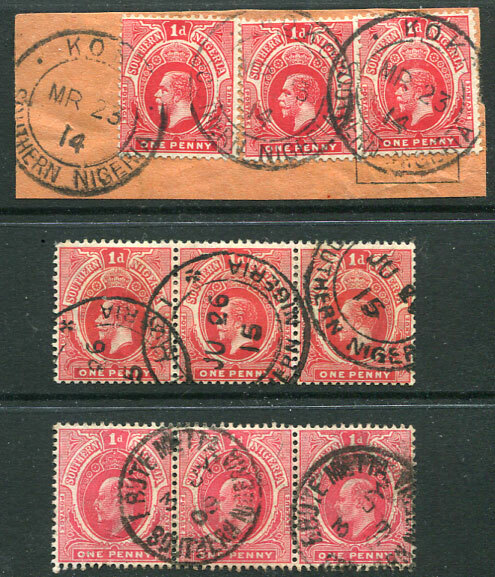 (T.5) JN 27 1912 on KE7 dull purple & chestnut MCA wmk pair and single (SG.24a, Cat.£80 each) piece. 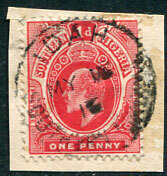 (T.P3) parcel cancel on QV 1d vermilion, worn and over-inked. 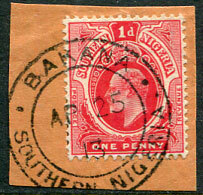 (T.5) AP 11 17 on Nigeria KGV 1d (SG.2a). (T.2C) AU 6 1908 on KE7 1d (SG.21). (T.2) A/OC 9 05 on KE7 1d Post Card cut-out piece. (T.6A) MY 15 16 on KE7 1d (SG.34) piece, late use KE7 adhesive. 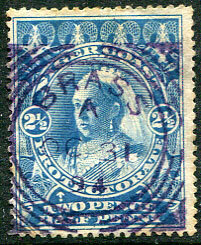 (T.R6) in blue ink dated A/14 JU 05 on KE7 1d (SG.22). (T.1A) A/JY 10 2 on QV 1d (SG.2). 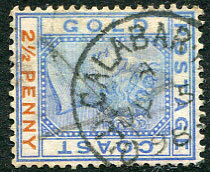 (T.R6) in blue dated A/AU 2 03 on KE7 6d (SG.15). 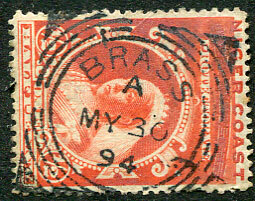 (T.2B, 2½mm letters) 13 OC 22 (LRD) on MCA INVERTED wmk Die I KGV 6d (SG.25aw), minor faults. 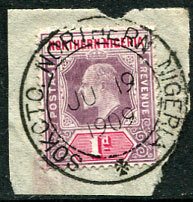 (T.2B, 2½mm letters) 28 OC 19 on Nigeria KGV 3d (SG.5). 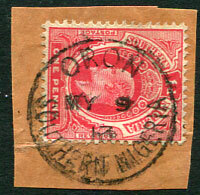 (T.2C) 10 OC 1915 on KGV 9d (SG.47). (T.2C) DE 21 1913 on KE7 5d (SG.34). 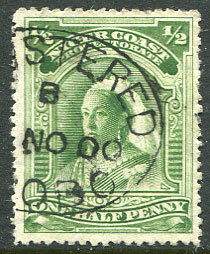 (T.2A) NO -- 1905 (the NO placed over OC date slug) on KE6 6d (SG.28, Cat.£65). 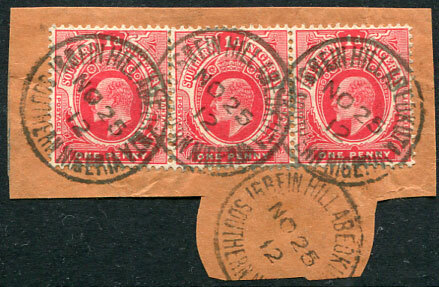 (T.2C) JU 19 1909 on KE7 1d (SG.21) piece. (T.4) A/AU 29 08 on horiz. 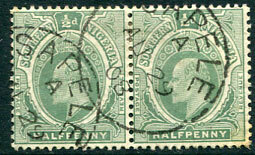 pair KE7 ½d (SG.23). 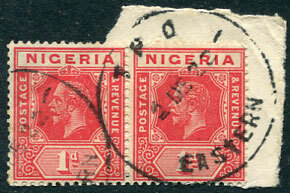 (T.7A) JL 12 13 on KE7 1d (SG.34) piece. (D1) 2 DE 22 on horiz. 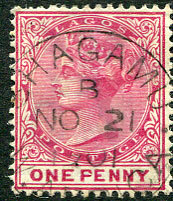 pair KGV 1d (SG.2a) piece. 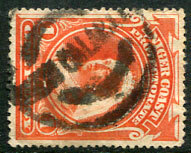 (T.R13A) A/AP 28 13 on vertical strip of three KE7 1d (SG.34) piece.